Today's storage world would appear to have been divided into three major and mutually exclusive categories: block, file and object storage. Much of the marketing that shapes much of the user demand would appear to suggest that these are three quite distinct animals, and many systems are sold as exclusively either SAN for block, NAS for file or object. And object is often conflated with cloud, a consumption model that can in reality be block, file or object. But a fixed taxonomy that divides the storage world this way is very limiting, and can be confusing; for instance, when we talk about cloud. How should providers and users buy and consume their storage? Are there other classifications that might help in providing storage solutions to meet specific or more general application needs? •How object based systems like S3 have blurred the lines between them and traditional file based solutions. 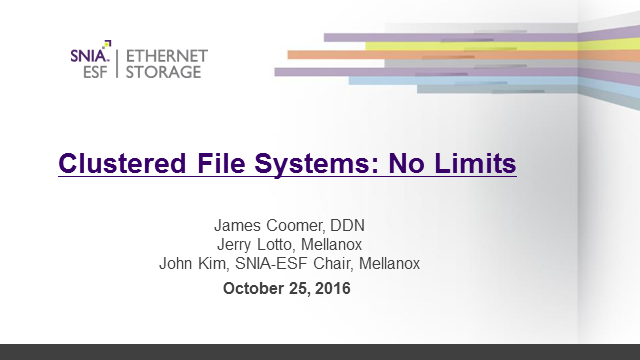 This webcast should appeal to those interested in exploring some of the different ways of accessing & managing storage, and how that might affect how storage systems are provisioned and consumed. POSIX and other acronyms may be mentioned, but no rocket science beyond a general understanding of the principles of storage will be assumed. Contains no nuts and is suitable for vegans!